This paper introduces a unique method to fabricate free-form symmetrical three-dimensional single-mode waveguides embedded in a newly developed photopolymer. The fabrication process requires only one layer of a single material by combining two-photon lithography and external monomer diffusion resulting in a high refractive index contrast of 0.013. The cured material exhibits high chemical and thermal stability. Transmission loss of 0.37 dB/cm at 850 nm is achieved. Due to the fact that waveguide arrays are produced with high density, this technique could pave the way for three-dimensional optical interconnects at the board level with high complexity and bandwidth density. D. A. B. Miller, “Rationale and challenges for optical interconnects to electronic chips,” Proc. IEEE 88, 728–749 (2000). S. H. Hwang, M. H. Cho, S.-K. Kang, T.-W. Lee, H.-H. Park, and B. S. Rho, “Two-dimensional optical interconnection based on two-layered optical printed circuit board,” IEEE Photon. Technol. Lett. 19, 411–413 (2007). H. P. Kuo, P. Rosenberg, R. Walmsley, S. Mathai, L. Kiyama, J. Straznicky, M. Mclaren, M. Tan, and S.-Y. Wang, “Free-space optical links for board-to-board interconnects,” Appl. Phys. A 95, 955–965 (2009). 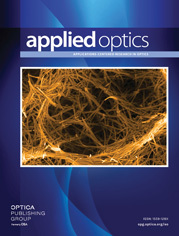 R. C. A. Pitwon, K. Wang, J. Graham-Jones, I. Papakonstantinou, H. Baghsiahi, B. J. Offrein, R. Dangel, D. Milward, and D. R. Selviah, “Firstlight: pluggable optical interconnect technologies for polymeric electro-optical printed circuit boards in data centers,” J. Lightwave Technol. 30, 3316–3329 (2012). E. Zgraggen, I. M. Soganci, F. Horst, A. La Porta, R. Dangel, B. J. Offrein, S. A. Snow, J. K. Young, B. W. Swatowski, C. M. Amb, O. Scholder, R. Broennimann, U. Sennhauser, and G. Bona, “Laser direct writing of single-mode polysiloxane optical waveguides and devices,” J. Lightwave Technol. 32, 3036–3042 (2014). Y.-H. Pao and P. M. Rentzepis, “Laser-induced production of free radicals in organic compounds,” Appl. Phys. Lett. 6, 93–95 (1965). J. Fischer and M. Wegener, “Three-dimensional direct laser writing inspired by stimulated-emission-depletion microscopy [invited],” Opt. Mater. Express 1, 614–624 (2011). A. Arriola, S. Gross, N. Jovanovic, N. Charles, P. G. Tuthill, S. M. Olaizola, A. Fuerbach, and M. J. Withford, “Low bend loss waveguides enable compact, efficient 3D photonic chips,” Opt. Express 21, 2978–2986 (2013). E. D. Moore, A. C. Sullivan, and R. R. McLeod, “Three-dimensional waveguide arrays via projection lithography into a moving photopolymer,” Proc. SPIE 7053, 705309 (2008). N. Lindenmann, G. Balthasar, D. Hillerkuss, R. Schmogrow, M. Jordan, W. Freude, and C. Koos, “Photonic wire bonding: a novel concept for chip-scale interconnects,” Opt. Express 20, 17667–17677 (2012). M. R. Billah, T. Hoose, T. Onanuga, N. Lindenmann, P. Dietrich, T. Wingert, M. L. Goedecke, A. Hofmann, U. Troppenz, A. Sigmund, M. Möhrle, W. Freude, and C. Koos, “Multi-chip integration of lasers and silicon photonics by photonic wire bonding,” in Conference on Lasers and Electro-Optics (Optical Society of America, 2015), paper STu2F.2. J. Ishihara, K. Komatsu, O. Sugihara, and T. Kaino, “Fabrication of three-dimensional calixarene polymer waveguides using two-photon assisted polymerization,” Appl. Phys. Lett. 90, 033511 (2007). V. Schmidt, L. Kuna, V. Satzinger, R. Houbertz, G. Jakopic, and G. Leising, “Application of two-photon 3D lithography for the fabrication of embedded ORMOCER (R) waveguides,” Proc. SPIE 6476, 64760P (2007). R. Kinoshita, D. Suganuma, and T. Ishigure, “Accurate interchannel pitch control in graded-index circular-core polymer parallel optical waveguide using the mosquito method,” Opt. Express 22, 8426–8437 (2014). D. H. H. Nguyen, K. Kaleta, S. Hengsbach, U. Ostrzinski, K. Pfeiffer, U. Hollenbach, and J. Mohr, “Three-dimensional buried polymer waveguides via femtosecond direct laser writing with two-photon absorption,” Proc. SPIE 9130, 91300N (2014). H.-B. Sun, M. Maeda, K. Takada, J. W. M. Chon, M. Gu, and S. Kawata, “Experimental investigation of single voxels for laser nanofabrication via two-photon photopolymerization,” Appl. Phys. Lett. 83, 819–821 (2003). M. Ams, G. Marshall, D. Spence, and M. Withford, “Slit beam shaping method for femtosecond laser direct-write fabrication of symmetric waveguides in bulk glasses,” Opt. Express 13, 5676–5681 (2005). G. Cerullo, R. Osellame, S. Taccheo, M. Marangoni, D. Polli, R. Ramponi, P. Laporta, and S. De Silvestri, “Femtosecond micromachining of symmetric waveguides at 1.5 μm by astigmatic beam focusing,” Opt. Lett. 27, 1938–1940 (2002). H.-B. Sun, K. Takada, M.-S. Kim, K.-S. Lee, and S. Kawata, “Scaling laws of voxels in two-photon photopolymerization nanofabrication,” Appl. Phys. Lett. 83, 1104–1106 (2003). H. Sieber, H. Boehm, U. Hollenbach, J. Mohr, U. Ostrzinski, K. Pfeiffer, M. Szczurowski, and W. Urbanczyk, “Low-loss single mode light waveguides in polymer,” Proc. SPIE 8431, 84311R (2012). Fig. 1. Refractive indices of the resist measured at 1.540, 0.988, 0.594, 0.450, and 0.402 μm wavelengths and their Cauchy fitting dispersion curves. The refractive index of the uncured resist (black, 1) reduces slightly after UV cure at 365 nm and hard-bake at 50°C (red, 2) but decreases more significantly if a low-index monomer was diffused into the photoresist matrix before UV cure and hard-bake (blue, 4). The refractive index of previously cured resist (red, 2) hardly changes after the monomer diffusion process (green, 3). Fig. 2. Basic schematic of a 3D multiphoton lithography system (Nanoscribe GmbH). The femtosecond laser beam is focused into the photopolymer through an objective with a numerical aperture of 0.75. An AOM tunes the laser power allowing voxel scaling. A camera and an integrated confocal system map the sample position and tilt angles with respect to the laser beam. A QWP converts linearly polarized light into circularly polarized light for a laterally symmetrical voxel. A piezoelectric scanning stage drives the sample in 3D. Fig. 3. Fabrication flow of the 3D embedded polymer waveguides consisting of four main steps. (a) Spin-coating on a silicon wafer and prebaked for several hours. (b) 3D laser lithography to pattern the core trajectory with multiphoton absorption and a postexposure bake at 60°C for 10 min. (c) External diffusion of a gaseous monomer into the uncured resist in a closed chamber. (d) Flood UV exposure at 365 nm and subsequent hard-bake to stabilize the whole wafer. Fig. 4. (a) End-facet image of a waveguide. (b) Illustration of multiple sweeping. (c) Side-view SEM micrograph of single lines after developing the unexposed resist, and a closer view of the periodic height variation along the writing direction. (d) Relation between input laser intensity and voxel height in direct laser writing at different writing speeds of 100, 150, and 200 μm / s . The margin of error from the voxel height measurement is ± 0.2 μm . Linear fitting shows the possibility to adjust voxel height by adapting laser intensity at different writing speeds. Higher writing speed results in a smaller core dimension. Fig. 5. (a) Design of a 3D embedded waveguide (blue, solid) and its trajectory projections (red, dotted). (b) Microscope top-view image of a 7 × 1 waveguide array. (c) Microscope end-facet pictures of a 4 × 1 waveguide array with a pitch size of 25 μm. Fig. 6. Area refractive index profile of a sample waveguide at the end facet measured with the refracted near-field method in (a) a 3D graph and (b) its cross section at x = 0 . The peak index contrast between the core and the cladding at 678 nm is 0.013. Fig. 7. Near-field pattern of the waveguides measured at transmission wavelengths. The near-field intensity profile in false color measured at 850 nm in comparison with the physical core, and its cross sections in x and y (a),(b) at 850 nm and (c),(d) at 1550 nm. The 1 / e 2 mode field diameters are both 5.7 ± 0.3 μm at 850 nm and both 7.4 ± 0.4 μm at 1550 nm. Black curve: measured intensity profile; red curve: Gaussian fitting. Fig. 8. (a) Far-field pattern measured at 850 nm and its intensity profile cross sections. (b) Insertion loss measurement for cut-back method at 850 nm.